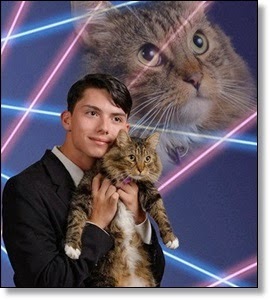 Upstate New York teen, Draven Rodriguez, a senior at Schenectady High School who proposed to have a yearbook photo of him and his cat against a backdrop of lasers, died on Thursday. The Times Union reports the cause of death was suicide. He was 17. Rodriguez made national news last fall when he started a petition to get his unique photo featured in the yearbook as his senior portrait. The petition was a precaution, while the school did not decline the photo just yet. "This is my pre-emptive strike just in case such a thing were to happen," Rodriguez explained in his petition. "I wanted as many backers as possible before the deadline of September 15th." However, even after reaching more than 7,000 signatures, Rodriguez was not allowed to use the photo in the yearbook. Instead, Principal Diane Wilkinson, and her Chihuahua Vivienne, joined Rodriguez for a new laser cat yearbook photo. Buzzfeed says the new photo will appear in the yearbook in order to raise awareness for American Society for the Prevention of Cruelty to Animals (ASPCA) and rescue animals. Rodriguez's father, Jonathan Stewart, tells the Times Union that his son "made friends wherever he went" and "had friends all over the country." Rodriguez is survived by Stewart; his mother, Melissa Petersen-Stewart; his 11-year-old sister, Lily Stewart; his biological father, Eric Rodriguez, and the Rodriguez family; among many others. In a Facebook post from Jan. 29, Rodriguez quoted Reza Zand as saying, "We are all people, and we should help each other out," the Times Union says. "He had an empathy for the world and for other people that I think is rare in kids his age," Stewart adds. "It was wonderful to see."